Jonah was more renowned for his ability to hit opponents hard and break tackles when having the ball in hand, but as you can see by these three huge hits, Jonah could also mix it up on defence. It's almost offensive defence to coin a phrase from our american friends. Hit 1 - "I don't want the ball." Against South Africa, a simple pick-up and dump on the spot. Stefan Terblanche won't be trying that again. Hit 2 - "Oh, dear! Take that!" This time it's the Super 12. Highlander's loosie Calvin Middleton fakes the kick while moving along the right-hand touchline. Maybe he should work on that bit more. Hit 3 - "Welcome to the field, Ben Tune!" Bledisloe Cup rugby this time. The Aussies run a set move from the line-out. It's looks like Ben Tune has come over from the far wing to breach the defense of the All Blacks. Not this time son. With the World Cup about to start we'll be watching every game and making sure that when massive hits like this happen, you'll get to see them right here on rugbydump.com, so keep coming back to watch the carnage as the tournament unfolds. love it!! jonah was a monster, no doubt about that. 3rd one is my favourite. Perhaps the League folks can learn a bit from Jonah... you can still crush a player with a tackle whilst wrapping! He has a cool video on adidas.com Go there and look at the impossible is nothing campaign. He talks about his kidney problems. Very soft spoken for such a large man. I guess it's in the water! Woah! those are good hits! Tune gets up pretty quickly, the first one was the best. 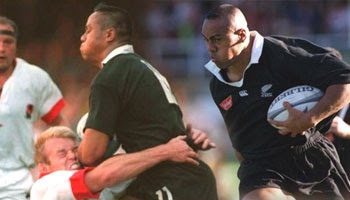 lomu was definately one of the greatest wingers ard.. but defense was not one of his stronger points.. he was usually pulling jerseys. these videos being the exceptions.. if he went for the big hits all the time.. he wld have been a real monster on atk and defense.. but he's still awesome.. Number 2 Is The Best! Da Geeza Gets Crunched! 3rd looks high with the left arm...and charged with the head too..all respect to Jonah. Mbe Lomu was still dirty about Tune shuting him down in the 95' Bledisloe in Brisbane..
thanks for posting this kind of stuff we could see nowhere else on the net! !